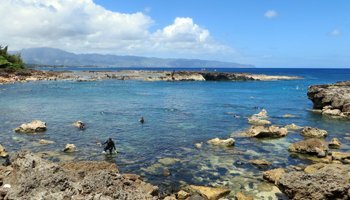 Sharks Cove Hawaii: a Snorkeling, Lava-Caving, Cliff-Jumping Hawaii Adventure. Sharks Cove Hawaii in Summer is Amazing for Diving! 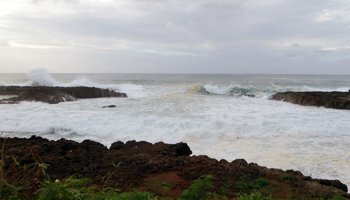 On the other hand, if you go to Sharks Cove Hawaii when the winter surf is getting big, the conditions are much more suitable for dying. Just compare the pictures at left and above-left. Those waves against those rocks would smash you into a bloody and broken ball of goo! That’s a terrible way to end your Hawaii vacation. Do not under any circumstance go into the water at Sharks Cove when the surf is up. I don’t care how adept you are in the water… that’s just foolish. I’ve never been dumb enough to do it, and I don’t know anybody else who has. You shouldn’t be the first. 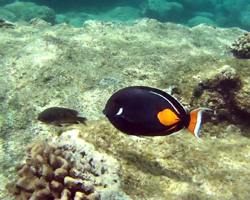 For most visitors, Hawaii snorkeling is the adventure of a lifetime! If you fall into that category of people, grab your dive gear and go have some fun! Maybe skip to the bottom of this page for some helpful tips. 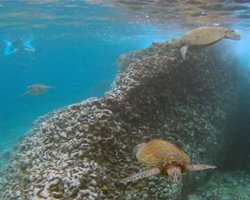 However, in case you’re interested: swimming around looking at fish (and maybe a reef shark if you’re really lucky) isn’t the only Hawaii adventure activity at this unique North Shore Oahu beach! 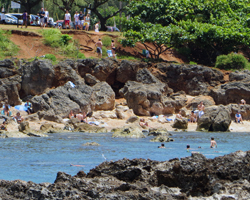 Next to Sharks Cove Oahu (to the left when facing the ocean from shore) are the Pupukea tide pools. Wading and exploring in these is really more of an adventure for really young children than for anybody over the age of four. But, I suspect that if you don’t have snorkeling gear and you’ve never seen any ocean life, even this could be exciting stuff! Beyond the tide pools on the left wall of the cove, there’s a rock ledge that’s suitable for cliff-jumping. The rock is only about three meters high, so this is definitely a beginner jump. And quite frankly, the lava rocks you have to walk across to get to the jumping rock are so sharp that I tend to think the difficulty outweighs the thrill. Nevertheless, it’s always fun to jump in the ocean; and the climb is a lot better when you wear reef shoes. 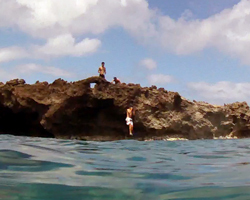 Just think of it as practice jumping for the rock at Waimea Bay. You can see the underwater tunnel without having to swim through it. To do so, just walk up onto the dangerously jagged rocks on the right side of the cove. Look for a trail of poured concrete “steps” to make the path easier. 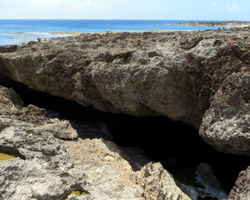 Near the middle of the rocks is a cave entrance to the lava tunnels. You’ll know you’ve found it because of the visible water inside. You can climb down into the cave, drop your head below the water, and see the light where the tunnel exits out to the open ocean. This tunnel is as wide as a two-car garage; and it’s approximately 10-meters long! Within the same cave exposed portion of the cave, instead of facing out to the open ocean, turn and look in the direction of the highway. The tunnel continues (though much smaller) all the way to the patch of sand in the back-right corner of the cove. 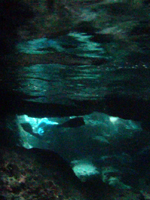 The underwater lava tunnels at Sharks Cove Hawaii are popular with scuba divers; but it’s also possible to swim through them without any air tanks. I’ve gone through both of these sections of tunnel without any scuba gear (though not during my most recent visit, because I wasn’t in my best state of fitness at the time). If you’re thinking of attempting the same, I would just caution you to make sure there is no surf to cause currents that might hinder your progress. Actually, I have more cautions below. Sharks Cove Hawaii really isn’t a beach by the expansive white sand definition. In fact, there is very little sand on the back edge of the cove (closest to the highway) and in the back-right corner (when facing the ocean from shore). Otherwise, the area is very rocky both in and out of the water. As a result, with the exception of the tide pools next to the cove, this really isn’t the best beach for families with young children. 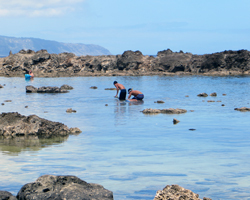 There are bathrooms and showers at Sharks Cove Hawaii, but there are no other conveniences (concessions, etc), and there is no lifeguard on duty. Much of the exposed lava rock that makes up the walls of this cove are formed from jagged aa (ah-ah) lava. It’s particularly painful trying to walk across this stuff in bare feet. Bring some reef-walking shoes; and be careful not to trip. If you fall on these rocks, it’s likely to require stitches and guaranteed to be unpleasant. 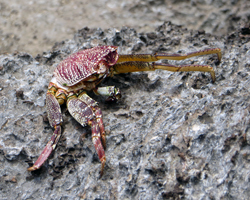 Kids: keep your eyes open for these dried-out crab shells. They’re good for freaking-out your mom or sister. 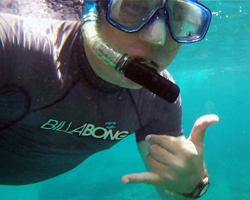 You will need to bring your own snorkeling gear. Sharks Cove Hawaii is not fully developed for tourists like Hanauma Bay – which can be good or bad depending on your perspective. Parking is limited but usually adequate on all but the most-crowded days. Arrive early for best availability. There is very little shade anywhere at Sharks Cove Hawaii. You should definitely give yourself a good covering of sunscreen and wear protective clothes. You might even want to bring a golf umbrella or small canopy. If you go diving, remember that the mask will wipe away some of the sunscreen you’ve applied to your face. Unless you want a sunburn in the exact outline of your mask, re-apply sunscreen after you’re done diving. Or, if you want to play a trick on somebody, don’t tell him/her this tip. It’s funny! 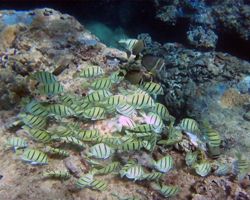 I’ve heard reports of white tip reef sharks being seen at Sharks Cove Hawaii. I personally have seen them elsewhere, but not here. Regardless, this type of shark is generally small (less than 1.5 meters) and almost always non-aggressive (unless provoked). If you get to see one, don’t provoke it. Duh. Keep a safe distance (five-ish meters) and enjoy the sight. If you have your camera, start shooting some video so you can brag to all of your friends. 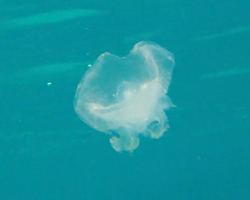 I saw a jellyfish for the first time ever at Sharks Cove during my most-recent visit. It’s a good idea to avoid contact with these guys. Nevertheless, they’re beautiful to watch. 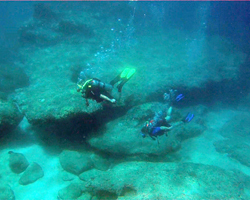 The network of underwater tunnels at Sharks Cove Hawaii is actually more extensive than just these that I’ve described, but you really will need scuba gear to explore all the passages. The other advantage of scuba gear is the added weight. 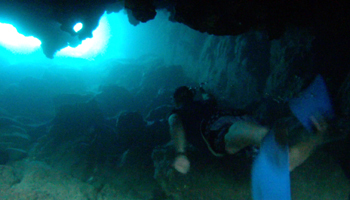 Ocean water is so buoyant that I kept kicking the ceiling of the cave just trying to keep myself down. 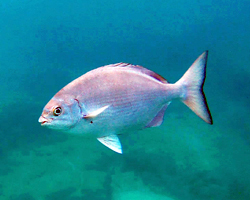 The cove is part of a marine life conservation district, so no fishing or spear-fishing; and please dispose of any trash properly. Do not attempt to touch the turtle(s). It’s illegal to disrupt or harass these animals in any way. Disclaimer: Stupidity and carelessness can kill you. Heed posted warning signs. If you can’t hold your breath long enough to swim the length of most recreational swimming pools underwater, you have no business attempting to swim through these caves. And if you get claustrophobic or prone to panic, it would be a mistake to attempt some of these activities. Use your brain and take responsibility for your own safety. Know the limits of your ability and stay within them. I’m not recommending these activities. I’m simply giving you information about them. The decision to do these activities is your own. Don’t give in to peer-pressure if these activities are beyond your ability. 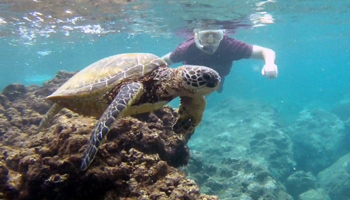 Just volunteer to take the pictures, and live to happily enjoy another Hawaii vacation day!